In November 1572, observers were startled by the appearance of a "new star" in the sky, about as bright as the planet Venus, in a place where no star had ever been seen before. Today we know that this "star" was actually a Type Ia supernova explosion, one of the rare stellar explosions actually visible to the unaided eye. 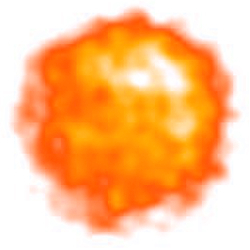 Type Ia supernovae mark the sudden death of a white dwarf star that accreted matter from a companion star, became too massive, collapsed, and blew up. Because this event was studied in detail by the great (and flamboyant) astronomer Tycho Brahe, this supernova is now called Tycho's supernova in his honor. Tycho's supernova is a particularly interesting object for astronomers, and particularly X-ray astronomers, since the material heated by the shock of the explosion still has temperatures of millions of degrees, and produces lots of X-ray emission. The image above is an new X-ray image of the Tycho supernova remnant by the Soft X-ray Telescope on India's AstroSat X-ray space observatory. The X-ray image and X-ray spectrum obtained by AstroSat will be used to study the chemical distribution of the hot material, and comparison of the new AstroSat observation to previous observations obtained by other X-ray observatories (like ROSAT, Chandra, XMM-Newton, Suzaku, and others) will help constrain the expansion and cooling of the shocked material.